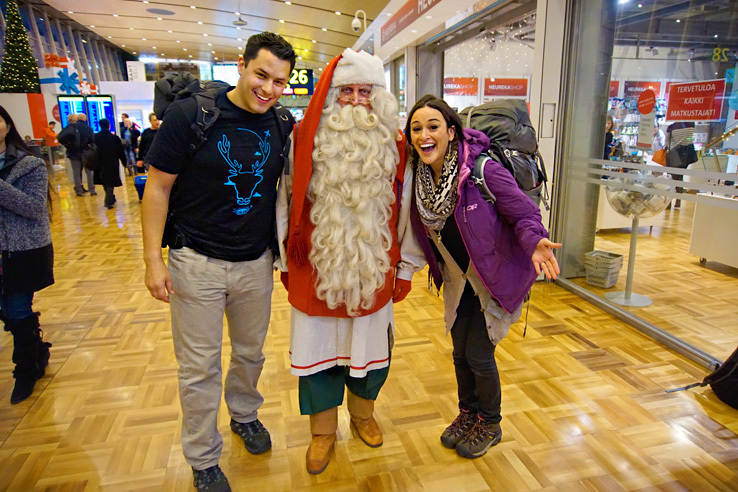 When we planned our trip to Finland in December, we had no idea what to expect. We knew we’d head to the Arctic Circle to see the official Santa Claus Village. We knew we’d shop at the famous Christmas markets in Helsinki. And we knew there was a chance to see the Northern Lights in Lapland. That’s all the convincing we needed, so we booked our trip! 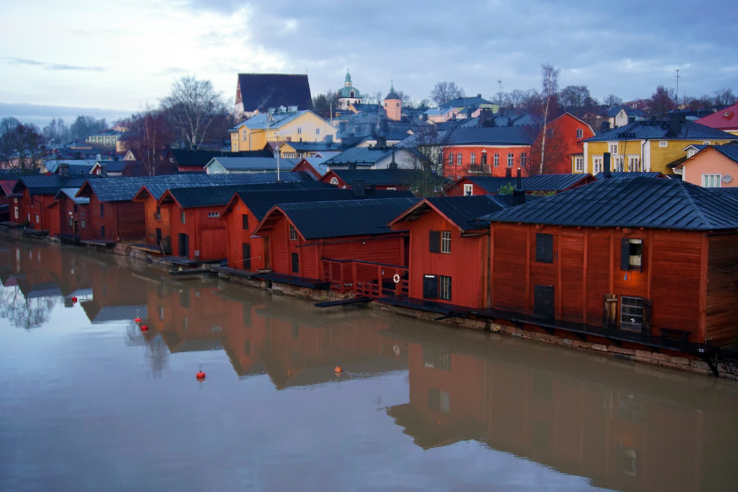 It would be an 8 day adventure: 5 days in the capital of Finland and 3 days in Rovaniemi, Lapland. As we continued our research, we quickly realized all 5 days needed to be spent exploring Helsinki. Everything we found was unlike any other travel experience we’ve had in Europe. There was more than enough to pack our 5 days full of unique adventures. Once we arrived to Helsinki Airport we decided to take the Yellow Shuttle from the airport to our downtown hotel. Because this is a taxi share service, it was the cheapest and quickest route. Our driver even took us on a mini night tour after he dropped off other passengers (a great start to our trip!) After a late arrival, we woke up refreshed and ready to go. Even though there’s not much sunlight in December, it was forecasted to be a COLD but beautiful day. So we headed to the Port of Helsinki. 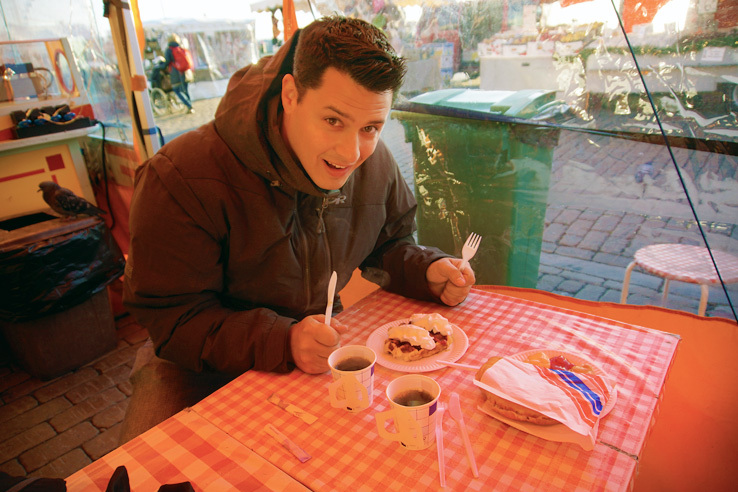 We grabbed a fresh waffle and meat pie from the Central Market Square, where you can buy cheap Finnish food and crafts, and hopped on a ferry to Suomenlinna Island. 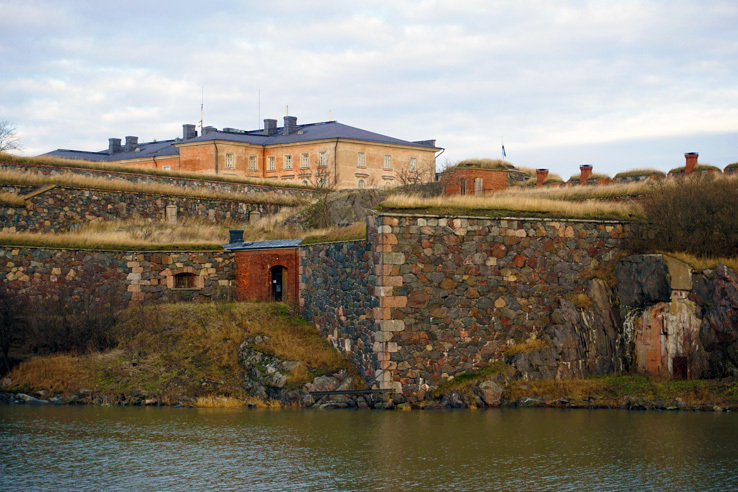 This island off the coast of Helsinki is where the Suomenlinna fortress sits, a UNESCO World Heritage site. Just 5 euros per person and a quick ferry ride from the port will take you there. A place of raw natural beauty and so much history. Lucky for us, during the month of December, the fortress hosts a GNOME TRAIL! Although the trail was totally meant for kids, we immediately decided to join in (wouldn’t you do the same?!) The mission was to find all the hidden gnomes throughout the island, take a picture with each and get a prize when you’ve found them all! 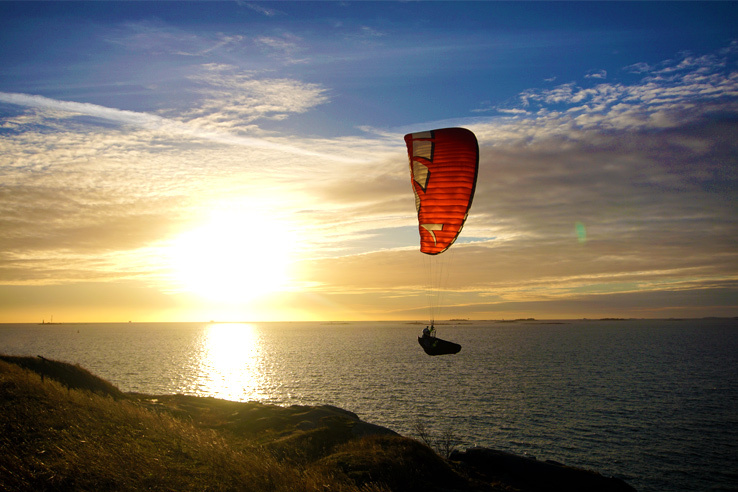 The perfect way to explore Suomenlinna AND walk away with a souvenir. SERIOUS WIN! We spent the day uncovering gnomes, wandering the historical fortress, and watching a magnificent Finnish sunset (at 2pm!). It was the longest sunset we’ve ever seen! Then, it was time to head back to the city. On our stroll home, we stumbled upon Stockmann’s holiday windows. Stockmann in Helsinki is the Macys of NYC. Every year, they create the most magical holiday windows of all time. 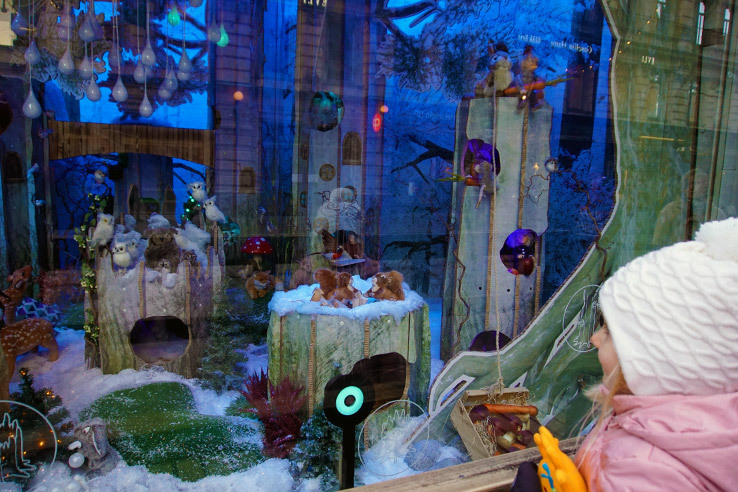 Finnish children were gathered at each window to admire the world of imagination that Stockmann created on their street corner. Nothing made us happier than watching the children’s’ faces as they gazed, eyes wide open at these windows. That feeling of pure happiness was a sign of everything to come in the following days. Day 2 in Helsinki was one of our favorite days of all. We hopped on a OmniBus out of the Kamppi Bus Station, the main bus terminal, and headed to Porvoo, the 2nd oldest medieval town in Finland. The bus will take you there directly in only an hour. Right when we arrived, we noticed the red-colored shore houses on the water, which are a proposed UNESCO world heritage site. So charming and simply breathtaking! We spent the day strolling around Porvoo, shopping at its toy stores and arts & craft shops and taking in our surroundings. It was one of the most unique places we’ve ever seen. Of course no visit to Porvoo is complete without stopping at the Brunberg Candy Store (to get famous milk chocolate truffles and licorice) and the Porvoo Roastery Bar & Café, for a delicious cup of coffee. Both are famous throughout Finland! 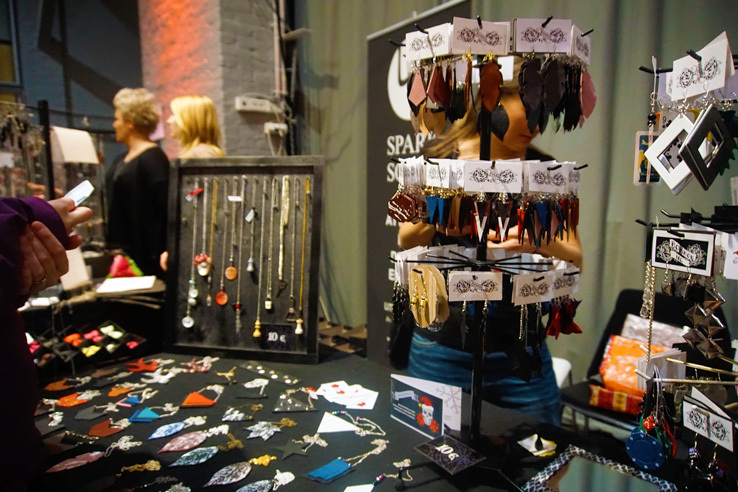 Porvoo also hosted a Christmas Market in the old town with local artists. To us, there is nothing better than markets where you meet the artists, see their passion and admire what that passion has created. After a full day in this medieval town, we hopped back on the bus and said goodbye to a place we’d so quickly fallen in love with. The rest of the night we strolled along Aleksanterinkatu in Helsinki, also known as the Street of Lights, admiring the city’s festive decorations for the holidays. 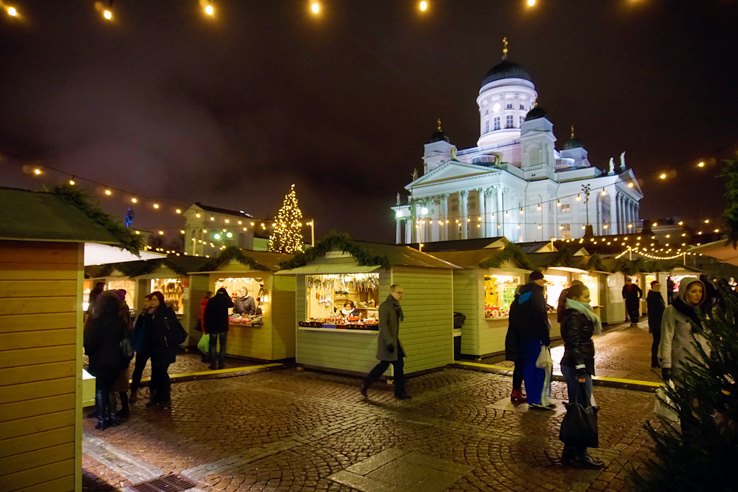 Helsinki is truly a Christmas city! We started our day walking the city, discovering endless thrift stores and antique shops along our route. There are so many throughout the city, which was one of our favorite parts about Helsinki. Thrift stores are the perfect place to grab unique souvenirs – better than what you’ll find at a tourist shop and less expensive. We passed the Finland National Museum and finally ended up at Korjaamo Culture Factory in the design district, for handmade jewelry and holiday crafts. The rest of our 3rd day in Helsinki was planned completely around the St. Lucia Parade, an annual event that takes place in Finland’s capital. This day is meant to honor the newly crowned Lucia of Finland with a parade and horse-drawn carriage. It is a festival created to bring light and hope in the middle of Finland’s darkest season (literally). Finland’s Lucia is chosen every year, and she is the closest thing to royalty. We felt lucky to experience this annual event and parade in person! 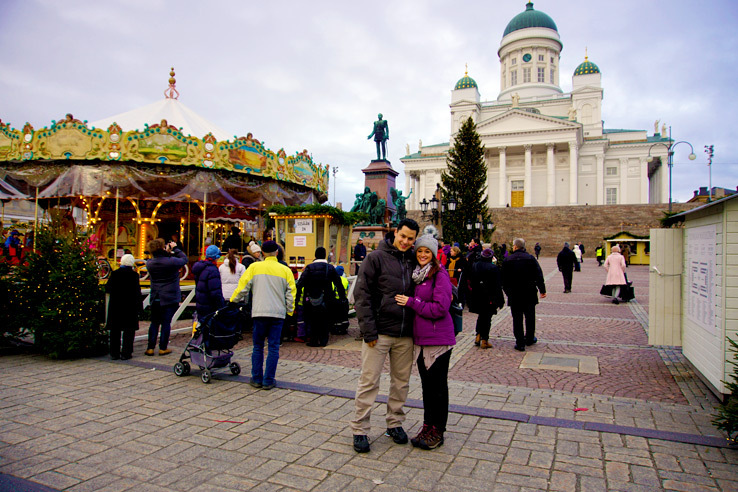 After the ceremony, we spent the night enjoying Helsinki’s famous Christmas Market in Senate Square. The crafts that we found and artwork that we purchased were so unique to the area. We even had to purchase an entirely new suitcase to take home presents for our friends and family. And did I mention that the cinnamon buns at this market are to die for? We might have enjoyed more than a few as we shopped… For fuel of course! Our last stop of the night was Fazer Chocolates, the most famous chocolates in Finland. 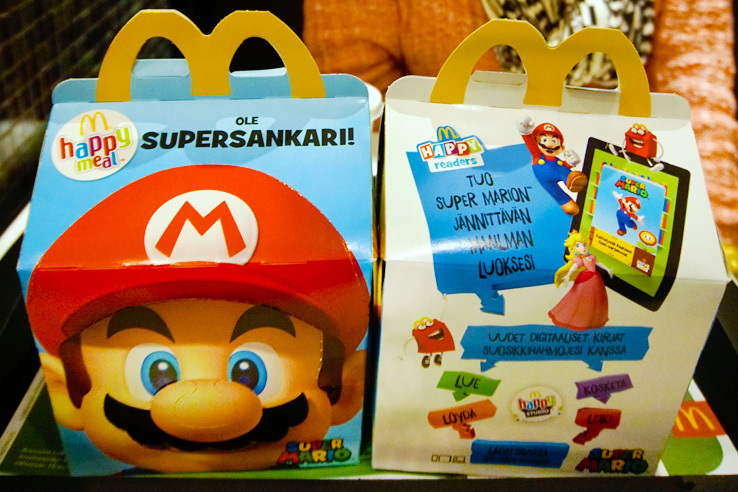 No visit to Helsinki is complete without purchasing these treats! 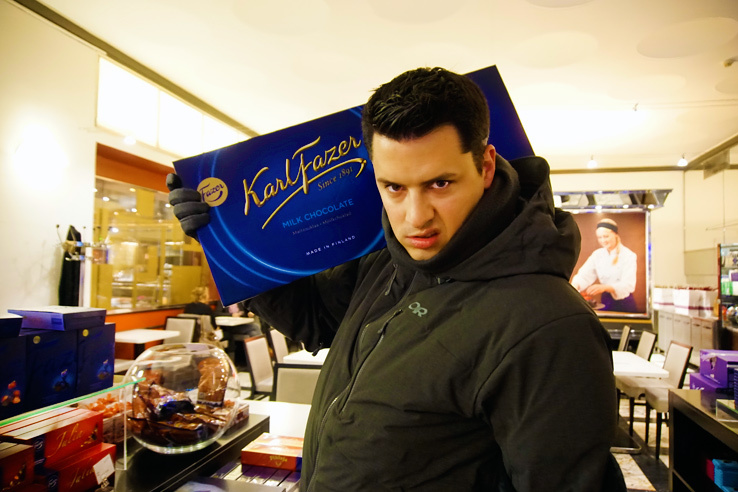 They even had GIANT chocolate bars if you want an endless supply to take home. Day 4 was our last full day in Helsinki, so we had to make the most of it! 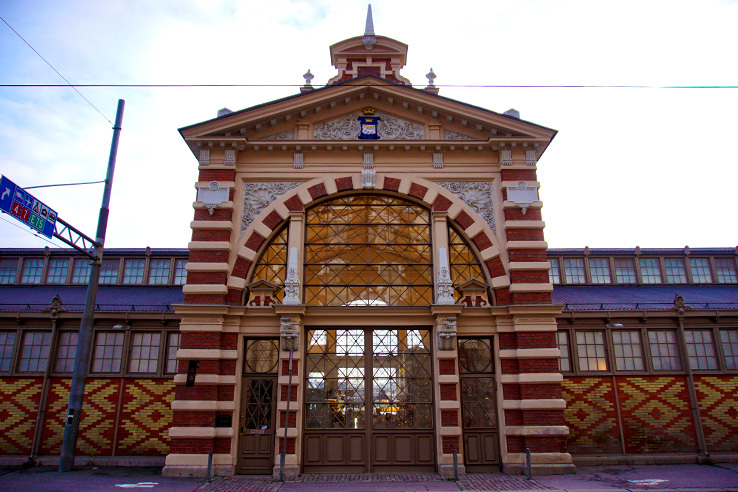 We started our morning by visiting the Old Market Hall, where we found the most delicious Finnish dishes! 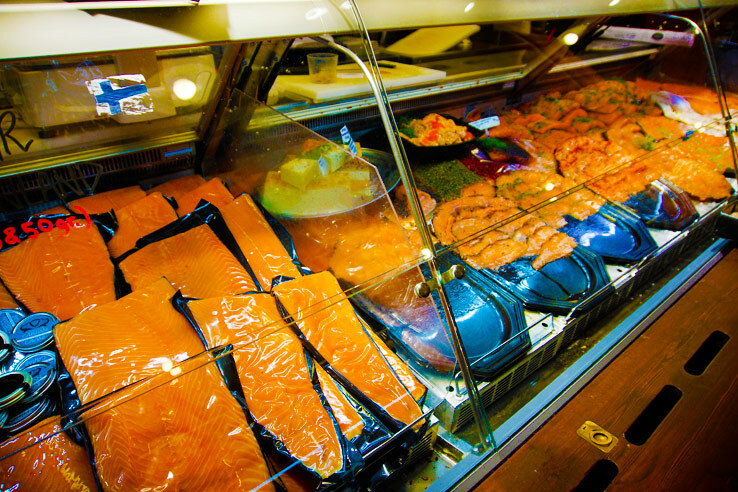 Seafood soups, pastries, salmon and so much more. All the food that Finland is known for in one spot. It was reasonably priced, fresh, and authentic. 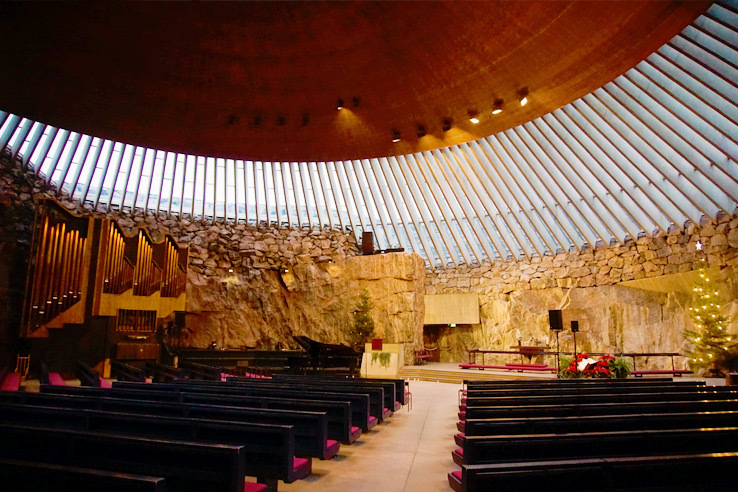 We then went on a journey to see Rock Church (Temppeliaukio Kirkko), a church excavated and built into solid rock with a skylight surrounding the dome. It was so fascinating to see this church in person, since it’s different than the elaborate cathedrals throughout Europe. After snapping a few pictures of its natural beauty, it was time for lunch. Lunch buffets are popular throughout Helsinki, so we stopped at Ravintola Konnichiwa a sushi buffet down the street from the Rock Church. For 15 euros each, we chowed down on all the sushi we could fit into our mouths. Definitely the best deal we found in Helsinki. Then we headed to one more holiday craft market – Kaapelin Joulu in Kaapelitehdas, which ended up being our favorite market of all! To end the night, we had to try Woolshed Bar & Kitchen’s award-winning avocado bacon burger – rated #1 in Helsinki! It definitely lived up to all the hype and was the perfect way to end our last night in Finland’s capital. Our flight left that night, so we had to make the most of our final hours! Right when we woke up we headed for the Central Market for breakfast again (it was the most affordable we could find), and then Senate Square. We had to get pictures in the daylight! 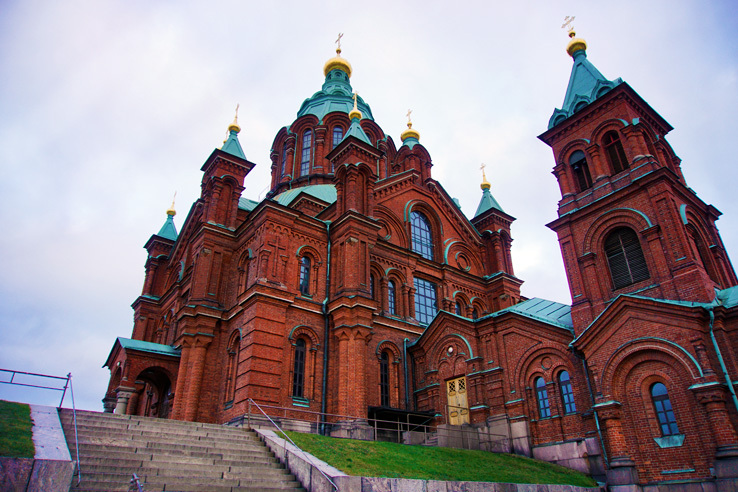 Plus, the Helsinki Cathedral is also located here, and is a landmark of the city. After Senate Square, we went on a hunt to find reindeer hide, a souvenir that Erin hoped to bring back to Austria, since it’s what Finland is known for. Unfortunately, it didn’t make sense for us to fly back with it (and I was kind of grossed out by the idea!). We did discover that XXL Sport is the cheapest place to buy reindeer hide in Helsinki – only 90 euros – which took a lot of research. Maybe for next time! Last but not least, we ventured to Uspenski Cathedral, another cathedral overlooking the city. 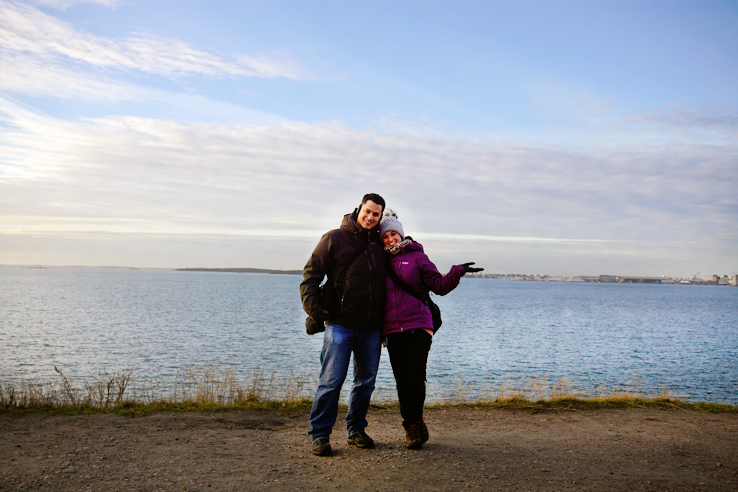 We found this one to be more elaborate than the Helsinki Cathedral and it had great views too! After a quick stop at the tourist shops, it was time to grab our bags, hop on the I train (the P train will also take you directly to the airport) from Helsinki Central Station and head to the airport for our final departure. Little did we know, we would physically be leaving Finland that day, but Finland would never be leaving us. 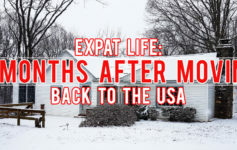 Every day since our departure, we reminisce about the adventures we faced. Our love and appreciation for this amazing country continues to grow, with every day that we’ve been gone. I guess absence really does make the heart grow fonder, even when it comes to destinations! Travel obstacles and how we overcame every one. Problem: Traveling to Finland in December means a late sunrise and early sunset. So how could we see as much as possible when our day time was limited? Solution: To our surprise, the lack of daylight was not an issue at all. 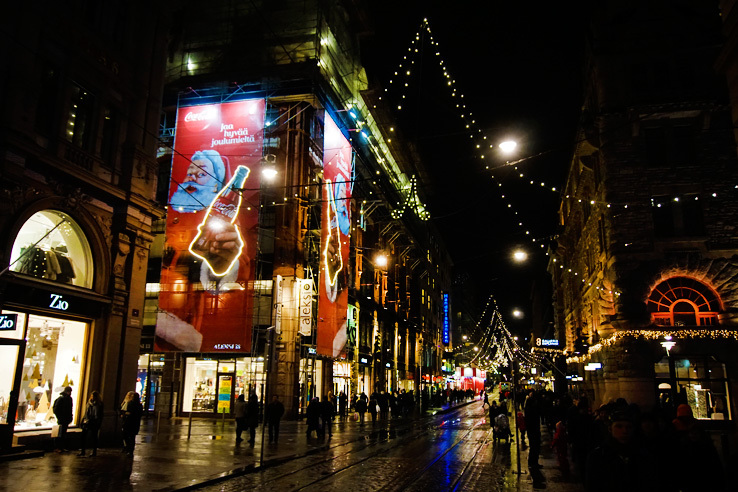 We planned our entire itinerary around the sunrise/sunset, getting in all the sites we could during the day, and enjoying the fabulous holiday markets and decorations at night. Plus, the lack of sunlight doesn’t mean its pitch black; it’s just dim and gray. Problem: Eating out in Finland was EXPENSIVE and we were definitely not expecting it. Solution: Before we dined anywhere, we took the time to look through all menu prices. Sure this added a lot of time to our restaurant search, but it was more than worth it. We also ate bigger lunches and lighter dinners, which is the key to saving money on food. There are lots of lunch buffets too, which is great value, and of course the grocery store also came in handy. We stocked up on as much healthy, filling snacks as we could so that we wouldn’t get as hungry. And there’s always McDonalds! Solution: We learned that alcohol in Finland is taxed higher, which explains the high prices. Drinks simply had to be out of the question. Since we were traveling on a budget, we had to think of what was most important. With food being higher than we planned for, the social atmosphere we were looking for had to be sacrificed for food and other more memorable experiences. We also made a stop at a grocery store for a bottle of wine, just to keep our night in the hotel entertaining! With a movie and a bottle of wine, we were two happy budget travelers. Problem: Sometimes not everything runs smoothly. We waited at the wrong place to get picked up for our day trip to Porvoo and completely missed the bus. But would we let that ruin our day? Solution: Of course not! First we called the bus company to see if we could take a later bus – no luck! Then we walked to the main bus station determined to make it to Porvoo. 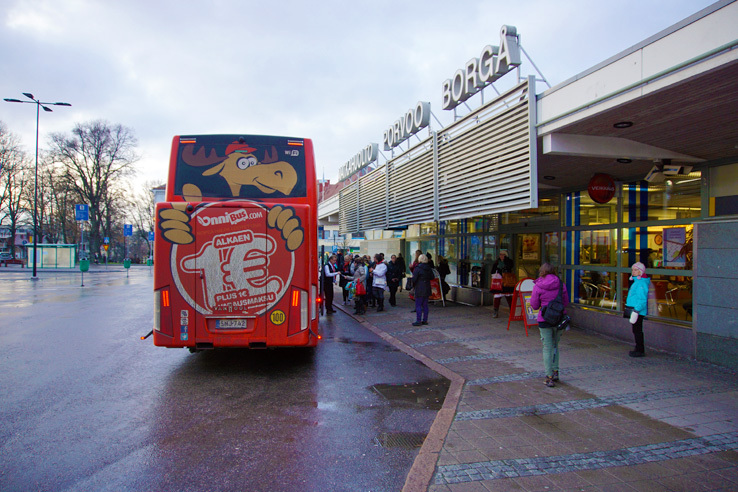 Lucky for us, we found out that MANY bus companies offer a service to Porvoo. We got our 1 way ticket (only putting us behind about 20 bucks) and used our round trip ticket we’d purchased before to travel back that night. Working through that hiccup turned into one of our favorite days in Helsinki. Problem: Unlike our research suggested, we didn’t get a 4-day transportation pass for transportation within the city. Solution: And that resulted in so. much. walking. Seriously we walked the entire city, and Helsinki is definitely not condensed. If we had the Helsinki transportation pass, we’d be able to get around quicker and more efficiently, but on a positive note, we explored so much by foot! Although quick transportation makes traveling more efficient, it can also mean you miss out on the best parts of the city. For this reason, nixing the transportation pass was a good decision for us personally. What we missed in Helsinki and why it’s okay. It’s important to point out that there are plenty of other great attractions in Helsinki that we didn’t get to see. The city has a TON of unique museums – Finland National Museum, the Museum of Contemporary Art, Bank of Finland Museum, etc. Since our trip was in December, instead of spending our days indoors, we chose the festive holiday events that were taking place instead. Thrift stores and crafts are also 2 of our passions, and discovering that Finland has SO many of them changed our focus. How you decide to shape your itinerary will depend on a lot of things – what time of the year you’re visiting, how you like to travel and what’s most important to you. The Seurasaari Open-Air Museum and the Helsinki Zoo – Korkeasaari – both of which are located on an island – were at the top of our to-do list, but not ideal for December. The parks are also beautiful, but not ideal for December. 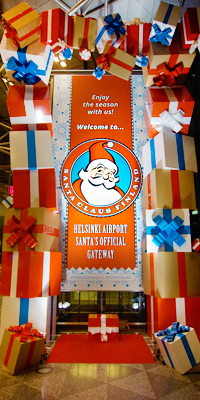 We were okay with giving up those sites to experience the holiday cheer that Helsinki is known for. Being flexible and self-aware is important to remember when you’re traveling. Following your heart and passions instead an overwhelming checklist of sites will allow you to leave with the same life-changing experience that we did! As you can tell by our travels, Finland holds a special place in our hearts. The challenges we faced, which are unavoidable during any getaway, and the unique and unexpected discoveries we made only made us love Helsinki even more. Never before has a country had such an effect on us. Whether it was the people, the sites, the artwork or the holiday cheer, there is something about Finland that we simply can’t describe. Something you could never possibly understand until you see if for yourself. If you share the same love for Finland, be sure to check out our Surviving Europe Finland tee! With every new country we explore, a new custom designed t-shirt is created. Each shirt is designed with one flight path, mapping out the most popular sites or symbols of each country. Rock a stylish travel tee for your next adventure AND support our site! Book Your Trip to Finland Today!